To tell the story of the final weekends of the Scouts 2017 Campaign? That lofty enterprise would require a full field of idioms, metaphors, and subtle exaggerations that no account could do realistic justice to. For Scouts Cranks it must suffice to hear the story of that journey in the familiar motif of an epic descent and return, for that is the manner by which the story of the recent exploits of the Stewart’s Creek nine might best be related. The saga picks up with our last dispatch, which related how much was ventured but nothing was gained or revealed to the Scouts in their late summer twin tilt with the Brentwood nine. Their position in the Cup seedings remained undecided after a split pair of matches to that plucky Traveller Club; and so the Scouts found themselves embarking on another rigid ascent up the Cumberland ridge, only to face the daunting descent hitherward to the Sixth Cavalry grounds. At this point the Scouts, though hopeful, could be forgiven for abandoning some of that hope as they faced off against the formidable Mountain City nine. This latter bunch, having tasted nary a drop of the bitter tonic of defeat over the course of the long campaign, were looking to cement their standing in league history as the Association’s first undefeated side. The Scouts had much to play for—most directly, a favorable seeding in the upcoming Sulphur Dell Tournament—and so were to slow to abandon those hopes as they entered those steamy grounds. Their wizened leader, Uncle Jessie, did much to buoy the hopes of his motley band of ballist pilgrims. Despite his gentle Virgilian encouragement and, later, his overt cajoling, the Scouts showed little spirit. And so his side showed uncharacteristic clumsiness afield in the early frames and little punch at the dish throughout. The result? Yet another victory to the Mountain City bunch, this one by a comfortable 8-3 margin, and so they seemingly drove yet another nail in the coffin of the Scouts’ once-promising season. As the last out was recorded the Chattanoogans exulted in their hard-won glories and the Scouts took another step toward the abyss, finding their spirits diminishing as their standing likewise dropped in the Association’s tables. The events of the following day, with the noble Maroons besting the formidable Farriers, would confirm what the Scouts most feared—that they’d miss their accustomed favorable positioning come tournament time. Inhabiting then the depths of deepest despair, the Scouts turned toward the grim work of preparing themselves for the Sulphur Dell Cup, held this weekend past at the Carnton’s Plantation. For those unfamiliar with this gala event, it serves the Association’s yearly celebration of the Campaign’s conclusion, with all twelve clubs taking the field to determine the Cup Champion. It is hard to tell what set the events into motion that led to the Scouts’ unexpected and, to them, exultant result. Some might credit to the events of the previous year, with that defeat by the Maroon nine. Some might credit it to those unfortunate developments in the Campaign’s later weeks, when the Scouts experienced some ill luck and also brought their misfortunes upon themselves with their errant play. Indeed, it was difficult to discern where the tides turned to orient fortunes of the Oaklands side favorably. 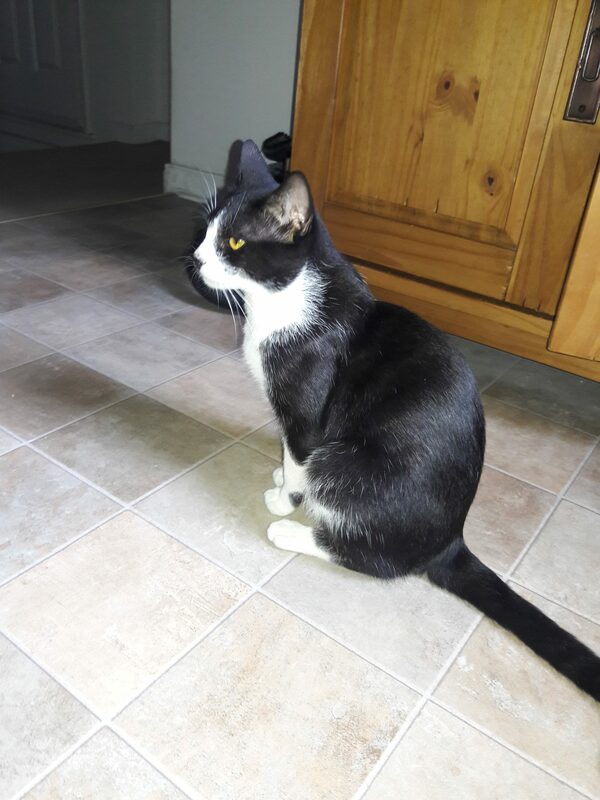 It was perhaps even begun in the wake of the Chattanooga debacle, when a member of the local side brought a new family member into his home and—perhaps presciently?—bestowed the moniker “Scout” upon the young feline fellow. Indeed, somewhere along the line the trajectory turned and the Scouts emerged from that season-ending Inferno of their own making, embarking upon a Purgatorial journey that would end with a small glimpse of the ballist’s moment in Paradise—that ever-elusive chance to raise the Cup in celebration of hard-fought victory. Denied the chance to experience that exultant moment last year, the Scouts likewise tested, and then tempted, the Base Ball Fates as they strode uncertainly toward this elusive goal. The first obstacle stood in the form of the emergent Cumberlander Club of the Hermitage Grounds. Advancing their prospects with a succession of aces in the contest’s early frames, the Scouts looked toward their next foes as that contest reached its later stages. Alas, that glance ahead was premature, as their opponents plated seven aces before the butterfingered Oaklanders managed to record the final out in a 12-10 victory that was too close for any of their collective comforts. 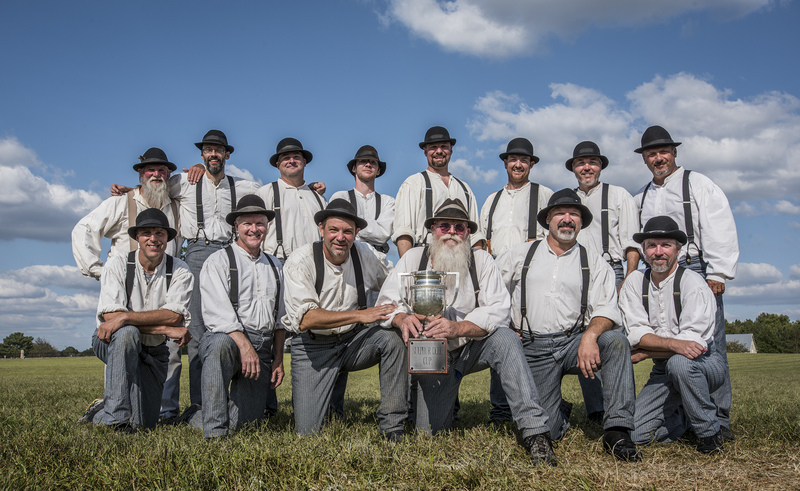 A Formidable crew of Farriers were their next barriers, that bunch also looking forward to their own brand of redemption to close out their own successful season. Both sides approached each other warily, looking for that precise occasion to capitalize on a moment of weakness. 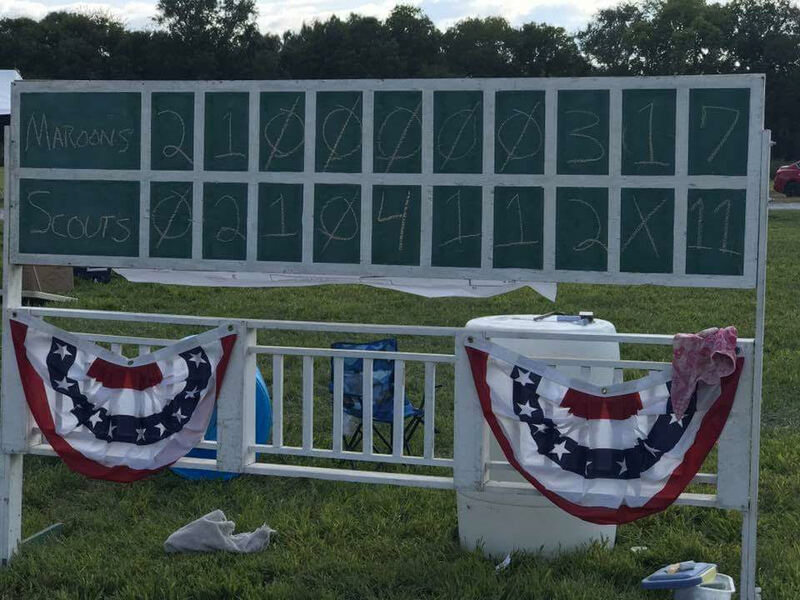 And for the Scouts that moment came in their seventh inning, when Tick-Tock’s timely two-bagger recorded the two tallies needed to secure the win by a margin of eight tallies to the Farriers five. With those two victories recorded, the Scouts gathered at the Associations grand ball that night ready to celebrate the successful campaign despite enduring their own collective purgatorial journey. Within those uncertain terrains the Stewart’s Creek nine still maintained the slightest shreds of faith in their own capacities and the slightest glimmer of hope in their prospects. Even as they celebrated the Bunyan’s (As In PAUL BUNYAN’S) reception of the side’s Most Outstanding Ballist award, the Scouts understood that yet another showdown with the mighty Mountain City Nine was in the cards. To a man they dutifully maintained the manners of celebration despite their collective tumult within, each mindful of the next day’s grim spectre, and each soon retreating to a night of fitful, uneasy rest. To repeat: it is hard to tell when the Base Ball deities turned the Fates in the Scouts favor. But once those forces were set into motion, they stayed in motion. The dark gulf between the Scouts and their hopes seemingly grew to a yawning chasm that in their early innings of the next day, as the Chattanoogans took an early lead. But with their resolve and their tolerance for adversity tempered by the rigors of the long campaign, the Stewart’s Creek saw their chance to shed their collective history and accept whatever fates awaited. To this end, the side battled back and gained uneasy advantage as the hard-fought, spirited contest proceeded toward its latter frames. A trio of aces was enabled with timely strikes by Mitts, Tick Tock, and Haybale, ensuring a margin that their mighty opponents were unable to surmount. More relieved than exultant in their 7-5 victory, the exhausted Scouts took to the shady barriers knowing that yet another motivated adversary—the Maroons—waited ominously in the wings. It is hard not to find some fortuitous serendipity in those developments, as those two very sides had squared off in last year’s Cup final with the Maroons justly taking the grand prize. And yet, it is also hard not to note hints of a providential design in that contest’s result. For in last year’s final, the Scouts took an uncertain lead into the contest’s late frames, only to see their highest hopes undone by some timely strikes and stellar play afield by the Maroon stalwarts. This year, however, the outcome would be different. Falling behind early, the Oaklands nine equalized with a single tally in the third frame. Fortuitously gaining and then padding their lead in the later frames, they remained fully aware of the likelihood of yet another Maroon onslaught. Though they drew blood continuously on this day, the Maroons’ mortal blow remained undealt as the Scouts clung grimly to the spectre of sweet victory, ultimately showing themselves unwilling to have the moment of glory wrested from them once again. Working through the same scenario as the previous final, this time the Scouts held their margin—and in their endeavors they shattered those mind-forged manacles that had previously separated the side from its ultimate moment. 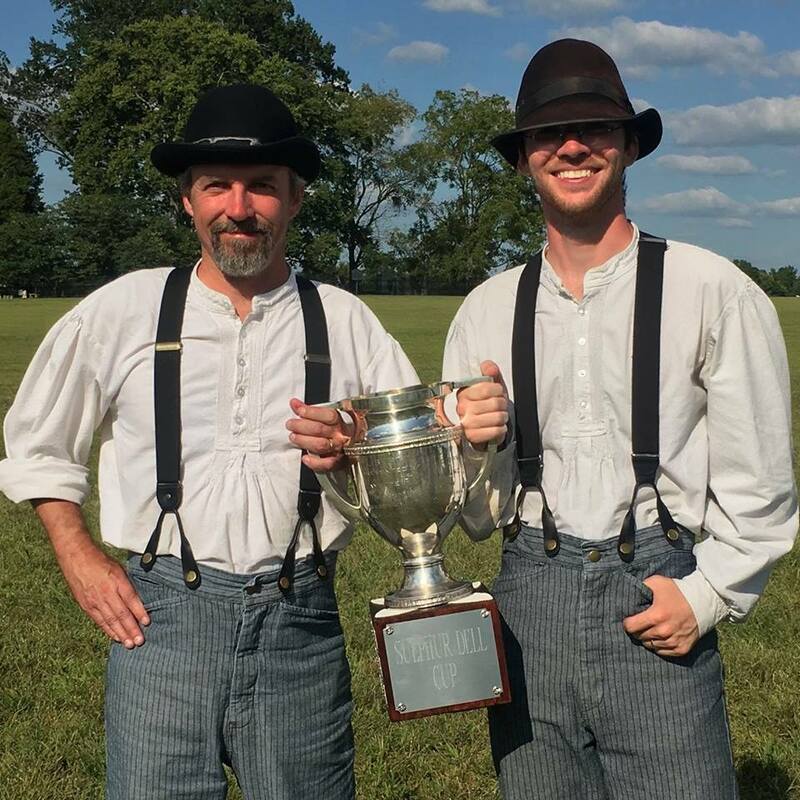 With the last out finally recorded in their 11-7 triumph, the Stewart’s Creek Scouts had thus forged a new identity—that of the 2017 Sulphur Dell Cup Champions. Readers throughout history have marveled at the detail, symmetry, and message of Dante’s Divine Comedy. But few readers have ever wished it any longer. In that spirit we’ll append our closing to this too-lengthy account, remarking also that as Dante’s Pilgrim emerges from his epic journey, in which he’d encountered both the depths of the abyss and the elusive glimpses of ultimate promise, and from which he yet returns to the world, he becomes mindful of the new responsibilities demanded of him. So too do the Scouts also realize that new mandates emerge from their unlikely triumph, recognizing also the duty, now doubly imperative, to assert the Association’s values and to live up to its ballist’s credo. Finally, as the attentions of sports cranks turn away from the newfangled sport of base ball and toward the more familiar interests of the sailboat races, the equine derbies, and the ars pugilistica, the Stewart’s Creek Scouts wish to thank their cranks and their opponents—their brother ballists—for their kind congratulations and good wishes, and also the Association for the grand campaign recently concluded. Likewise thankful for this moment of good fortune, the side will begin preparations for the 2018 Campaign, ready as always to remind all Association cranks and attendees of next year’s matches: “pro vestra exhortatione sellam aut stratum adduce et cibum libamentisque pro nutrimentum tuum.” See you next Spring! The Stewart’s Creek Scouts once again journeyed eastward this Sunday past, this time to do battle with the Machinist Club of the Emmett Company. This was the second trip to the Appalachian foothills for the Scouts within the past month; having met with success in the first outing to Knoxville’s Ramsey House Grounds, the Scouts knew that good fortune would have to turn events in their favor if they were to return to the mid-state region with another victory. Though they won the bat toss, the Machinists took the unorthodox step of electing to strike first, thus attempting to secure initial advantage. And so they did, plating a pair of tallies to set the tone for a back-and-forth, see-saw match. The Scouts replied with a single ace in their half of the first frame and registered three more in their third innings; and as the contest’s middle frames approached the two sides exchanged leads, seemingly with each passing inning. As the final frame approached the sides were deadlocked in a 9-9 tie, and the Scouts looked to turn fortune to their favor in their final at-bats. Alas, the Stewart’s Creek nine were unable to push across that decisive tally. Recording stylish “naughts” in both the ninth and tenth frames, the Scouts took to the pastures in the top half of the 11th inning hoping to prevent the Emmett side from gaining advantage. Despite some vaunted efforts in both the inner and outer pastures, however, the locals secured two aces which ultimately led to the final result, an 11-9 triumph. Both sides had competed gamely in the withering June heat; and with the final out recorded the Scouts congratulated their victorious opponent and then retreated to cooler spaces where they had secured post-game libations for their nourishment. The Scouts enter the Association’s mid-season hiatus as the very embodiment of inconsistency. Having alternated between stellar and listless play throughout the season’s first half, the Stewart’s Creek side remains committed to putting forth their best efforts in the campaign’s remaining contests. These will commence on Sunday July 16th at the fabled Hermitage Grounds, where the waterlogged Scouts were bested on their last visit. For this next visit the Scouts will hope for conditions more suited for base ball and will hope to emerge triumphant against the Association’s newest club, the Cumberlanders. This side, having tasted the sweet nectar of victory in its most recent contest, will be primed and ready for action against their newest rivals. Those cranks who wish to attend are encouraged to observe this ancient credo: “pro vestra exhortatione sellam aut stratum adduce et cibum libamentisque pro nutrimentum tuum.” Bat toss at noon. Hope to see you there! Under skies that threatened rain but never quite broke, the Stewart’s Creek Scouts took on the Distillers of the Highland Rim this Past Sunday. On this steamy day, the hot and heavy air likely accounted for a low-scoring, highly defensive contest. Still, the teams persisted. By virtue of a quartet of timely aces, tallied at strategic moments throughout the match, and with some stout defensive play on the damp and grassy turf, the Scouts ultimately triumphed by a score of 4-1. The contest will likely be the side’s final ball match to be played at the storied grounds of the Sam Davis Home. It was fitting on this day that the Scouts would square off against their old rivals, the Distillers, who have proven their competitive starch in seasons past. In keeping with its highly defensive character the contest proceeded rapidly, with both clubs exchanging good-natured jests and showing grand play afield as the innings passed. Scoring single tallies in the first, fourth, seventh, and eighth frames, the Scouts built a small lead which held until the Highland Rim bunch plated a single tally in the final inning, thus accounting for the result. The winning effort was led by Tick Tock and the Scotsman, the former showing grand form at the short scout position and the later wielding a fearsome willow throughout the match. The fine trio of pasture-minders, Shanks, Hay Bale, and Dutch, also contributed fancy plays which helped to keep the opposition in check. Indeed, on a day when the damp sod and heavy air kept many of the strikers out of their top form, the Scouts’ play afield proved essential to the final result. Accustomed to prolonged perambulations, the Scouts enter the middle section of their season facing a pair of sojourns to the foothills of Appalachia, where they will take on both Knoxville teams during the month of June, sandwiched around another visit to the Ravenswood grounds. The return of the Stewart’s Creek nine to Rutherford County is slated for late July, and as that date approaches a representative from the side will reveal the location of their remaining home matches. For now, however, we’ll end with this reassuring reminder: should you wish to join the Stewart’s Creek bunch in their immediate travels, please bring chairs and blankets for your comfort and victuals and libations for your nourishment. In temperament as much as in anatomical character, your 2017 Stewart’s Creek Scouts are seen generally as men of substance. Gravitas. Solidity. Formidability. In fact, many within their ranks show their fondness for the hopped and malted beverage, which perhaps contributes to this perception. And while this tendency toward weightiness might serve them well within tense moments of a spirited base ball match, it seldom encourages swiftness afoot when those same ballists are seen circling the base paths. So it is perhaps surprising that on a day when the Sam Davis nine were fortunate to strike the onion with their customary force and to gather it with uncommon skill, the most salient feature of their opening day triumph over the solid Lightfoot Club was found in their many hasty dashes around the sacks. Indeed, while many of the more substantial Scouts are known customarily as base “runners” in the loosest sense of the term, they collectively demonstrated uncharacteristic dispatch and uncommon nimbleness in their perambulations around the inner diamond this Sunday last, efforts resulting in an 18-9 triumph over the noble Chattanoogans. Their cranks are well aware of Tick Tock’s winged feet and Dutch’s comparable alacrity, and these Mercury-like features were certainly on display this Sunday last at Brentwood’s Ravenswood grounds. The Old Man showed some ginger about the base paths as well, and The Scotsman, no spring chicken he, was also seen stirring his stumps whilst moving between the sacks with characteristic frenzy. However, such uncommon swiftness was shown by some of the side’s more “rooted” ranks. Mitts sent a pair of mighty salvos out to the field’s deeper reaches and ended up with a three-bagger, which his teammates then celebrated with many a hearty whoop. The Bunyan—as in Paul Bunyan—was unexpectedly cat-like in his perambulations around the diamond, at one point ending up on the second sack after pulling a wrong-sided liner toward the deepest reaches of the right pasture. Perhaps now his alternate moniker—“the Puma”—will be invoked more routinely in future contests. Brass turned a regrettable moment—a clumsy stumble down the third base line–into a crackerjack show of deftness, scoring an improbable tally to the amusement of all. Even The Slow Poke spent some time on the base paths as the innings proceeded. An ace here, a few tallies there, a pair of four-spots here again—and so it went. By the game’s middle frames the Scouts had opened a comfortable lead that the Lightfoot were, at least on this day, unable to surmount. Such displays of pure agility are seldom demonstrated by the Sam Davis bunch, but it is hope that these results are the consequence of the rigorous off-season training regimen completed by all members. Unrealistic expectations aside, however, the Sam Davis bunch was able to demonstrate some skilled play against a solid side and will look to continue this effort as the new campaign proceeds. And proceed it will. For this very upcoming Sunday your Sam Davis nine will be back on their home grounds, taking on their old rivals: the Sulphur Dell Champion Nashville Maroons. The Nashville nine, coming off a season-opening triumph of their own, will help to establish whether the Scouts opportune speediness on the base paths is bona fide or whether it will be exposed as a mere fluke. Those cranks wishing to attend this regular season opener at the Sam Davis Home are, as always, advised to bring a chair or blanket for their own comfort and victuals and libations for their nourishment. The bat will be tossed at noon. Hope to see you there!